Imagine a landscape of soil, alive with energy: a network of tiny electrical pulses powered by bacteria. This is not science fiction: Yuri Gorby, a microbial physiologist now at the J. Craig Venter Institute in Rockville, Md., reported in the July 10 Proceedings of the National Academy of Sciences that some microbes — already valued for their ability to alter toxic metals to more harmless forms — can grow tiny electrically conductive wires from their cell membranes. Furthermore, the bacterial “nanowires” then reached out and connected to each other, forming an electronic network of cells. Such a community living underground, he suggests, could actually change the properties of the ground — in effect, making Earth’s surface hard-wired. Tiny, electrically conductive filaments connect these individual bacteria cells, which together form a living network of “nanowires.” Image is by Rizlan Bencheikh and Bruce Arey. This latest find is one of several over the past decade that have defined a new field of geoscience called biogeophysics. Using noninvasive geophysical techniques normally reserved to examine changes in underground structures, or to hunt for traces of water or contaminants, “biogeophysicists” are searching for electrical signals emitted by bacteria living underground. If scientists can understand and harness those microbial properties, says Lee Slater, a geophysicist at Rutgers University in Newark, N.J., they could be used for a range of applications, including mapping the edges of groundwater contaminant plumes, studying the effectiveness of bioremediation and more effectively recovering oil from reserves — and maybe even studying potential life on other planetary bodies. 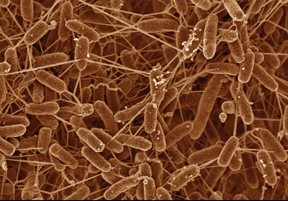 Even a decade ago, few scientists would have believed that bacteria might produce electrical signals that are detectable by well-known geophysical methods, says Estella Atekwana of Oklahoma State University in Stillwater. Geophysicists Atekwana and William Sauck of Western Michigan University in Kalamazoo certainly were not looking for microbes in 1998 when the researchers set out to study the soils at Wurtsmith Air Force Base in Oscoda, Mich., a site heavily contaminated with hydrocarbons. During their investigation of the site, however, Sauck and Atekwana observed that when they stuck electrodes into the ground and ran a current between them, the subsurface behaved in an unexpected way. “Oil is an insulator,” and areas with hydrocarbon contamination would therefore be expected to have low electrical conductivity, Atekwana says. Instead, the researchers found, the subsurface was actually conductive — a phenomenon that other scientists had reportedly noticed in contaminated sites, but “no one had really given a lot of thought to,” she says. In 2000, Sauck and Atekwana published a paper on the find, offering a surprising explanation: They suggested that the conductivity they had detected might be due to the result of bacteria munching on the hydrocarbons in the contaminated site. During biodegradation, Atekwana says, the microbes produce organic acids that leach out into the aquifer and interact with the rock, releasing ions into solution. The addition of charged ions could thus increase the conductivity of the subsurface, they reasoned. The response to the paper was mixed, Atekwana says. “People were skeptical,” she says. “If you look at the wavelengths that we measure in geophysics and the volume of Earth, it’s so large. So you couldn’t begin to fathom that processes occurring at micro- to nanoscales could affect geophysical properties.” Additionally, without knowing exactly how the bacteria were producing a detectable electrical signal, the researchers lacked “the smoking gun,” Atekwana says. Slater was intrigued by Sauck and Atekwana’s find, and has been investigating exactly how the bacteria produce detectable geophysical signals. “It’s really moved from just looking at contaminated sites to a much bigger field,” he says. Slater is studying how the microbes interact with minerals and form biofilms — microbial growth on soil particles and in pore spaces in rocks — and what sort of electrical signals they give off in the process. He and others also want to understand what makes the bacteria tick. Inert microbes produce no charge, but when they become active — for example, when they metabolize hydrocarbons — they start generating electrical signals, Slater says. How they produce those signals, however, is still not known. To help answer these questions, John Miller, a biophysicist at the University of Houston in Texas, is delving more deeply into “how these bugs emit these frequencies,” and is also developing new ways to detect them. The microbes contain active enzyme complexes, he says, that act like tiny biomolecular motors driven by ion gradients. Those motors not only power the bacteria, but also generate different electromagnetic responses, he says. Miller is currently working on pinning down how the different metabolic processes produce different electrical signals — both in terms of frequency and amplitude — by activating or inhibiting these enzymes, and observing the microbes’ response. So far, studies of the geophysical detection of bacteria have been largely laboratory-based, although detecting signs of microbial activity is “definitely achievable in the field,” Slater says. Because the signals will be most easily measurable in places where large populations of microbes flourish and are highly active, such as at contaminated sites, he says, bioremediation and microbially enhanced oil recovery are likely to be two of the more near-term applications, he says. 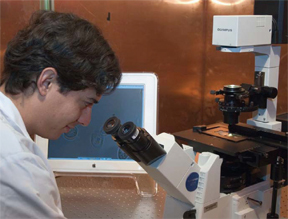 A doctoral student at the University of Houston in Texas studies the types of electrical signals bacteria produce when different enzymes are activated. By pinning down those responses, scientists hope to develop ways to detect living organisms underground. Photograph is by Dr. Irving Rothman, Institute of Space Systems Operations, University of Houston. Both bioremediation efforts and enhanced oil recovery rely on harnessing microbes’ activity, using it to either degrade and remove contaminants or to alter the physical or chemical properties of the subsurface. The microbes can help recover oil trapped in reservoirs by either reducing the surface tension between oil and mineral grains that binds them together, or by simply filling up the pore spaces in the rock, making it easier and more efficient to “sweep” the reservoir. Bacteria can also remove heavy metals such as uranium from groundwater, “acting as electron donors and mediating the precipitation of uranium from water,” a process known as biomineralization, Slater says. It can be difficult to track the effectiveness of these processes, however, which is where biogeophysics comes in. If scientists can identify the geophysical signals associated with bacteria during these processes, they can monitor the bacteria’s progress, Slater says. Atekwana notes that while geophysics cannot identify which bacterial populations are present, “we can definitely see the hot zones.” That means, for example, that scientists working on bioremediation can use these techniques to help determine where in a contaminated site they should sample. “You will significantly reduce the cost of remediation,” she says. While Miller says that the strength of the signals he observes is easily detectable within the range needed for enhanced oil recovery or remediation, it is uncertain whether those signals will be detectable in places with much smaller, or inert populations of bacteria — such as might be found on other planets, if they exist at all, Slater says. “That is really the critical question,” Slater says. The latest discovery by Gorby will undoubtedly push forward the fledgling field of biogeophysics, but techniques to detect the microbes are not yet proven, and are — like many issues in geophysics — subject to ambiguity, Slater says: “The classic Achilles heel is that the interpretation is uncertain because these are indirect measurements.” Using resistivity measurements to identify the microbial signals in the midst of other signals, such as temperature variations, groundwater flow and changes in groundwater chemistry, can be “horribly ambiguous,” he says. The hope, he adds, is that other geophysical techniques will help narrow down the uncertainties. Atekwana agrees: “Geophysicists have always prided themselves that they can investigate Earth processes without digging a single hole,” she says. “It allows us to investigate environments that we cannot otherwise access.” And biogeophysicists are looking at the “interaction of these systems as a whole. That can only be good for the science,” Atekwana says. “As tiny as they may be, microbes impact our Earth in a very significant way.